The Fourth of July is the day on which the American people celebrate their independence from Great Britain. It is not actually clear why Independence Day is the Fourth. Congress actually passed the Declaration of Independence on July 2, 1776. 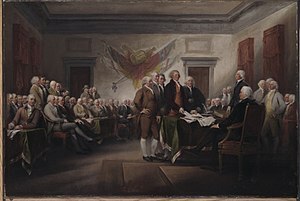 It has often been thought that the Declaration was signed on the fourth, but that doesn’t seem to be true. There wasn’t any one time when the members of Congress signed the Declaration and there were a few who didn’t get around to signing it until August. Nevertheless, the fourth is the date that stuck. As John Adams wrote to Abigail. The second day of July, 1776, will be the most memorable epoch in the history of America. I am apt to believe that it will be celebrated by succeeding generations as the great anniversary festival. It ought to be commemorated as the day of deliverance, by solemn acts of devotion to God Almighty. It ought to be solemnized with pomp and parade, with shows, games, sports, guns, bells, bonfires, and illuminations, from one end of this continent to the other, from this time forward forever more. And so it has been, for the last 241 years. May God bless America and grant us many more years of freedom. What is a Commonplace Book?